Late winter waves on Lake Erie lap at Point Pelee National Park. It’s summer on Lake Erie, 2015. People are enjoying family time on the beach. Tourists are flocking to the popular Point Pelee National Park. Commercial fishers and recreational anglers alike are taking advantage of Wheatley Harbour’s abundant freshwater fish populations. But a massive algae bloom nearly threatened these summer traditions. Deemed the largest one this century, a bloom the size of New York City took over a portion of Lake Erie. Thankfully, it stayed at the centre of the lake rather than the shoreline. That time. “Algae blooms have been a big issue in the last few years,” says Randall Van Wagner, manager of conservation lands and services with the Lower Thames Conservation Authority. When these blooms sink, they decompose and use up oxygen, which in turn kills fish and other aquatic life. Fast-multiplying toxic algae can make people sick, and make drinking water unsafe for human consumption. Van Wagner has seen the dramatic effects first hand. 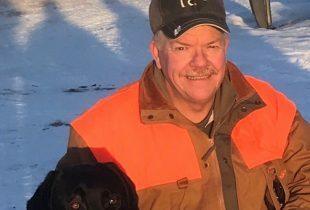 “You need a bulldozer and a dump truck to clean up the fish during massive die offs,” he says. 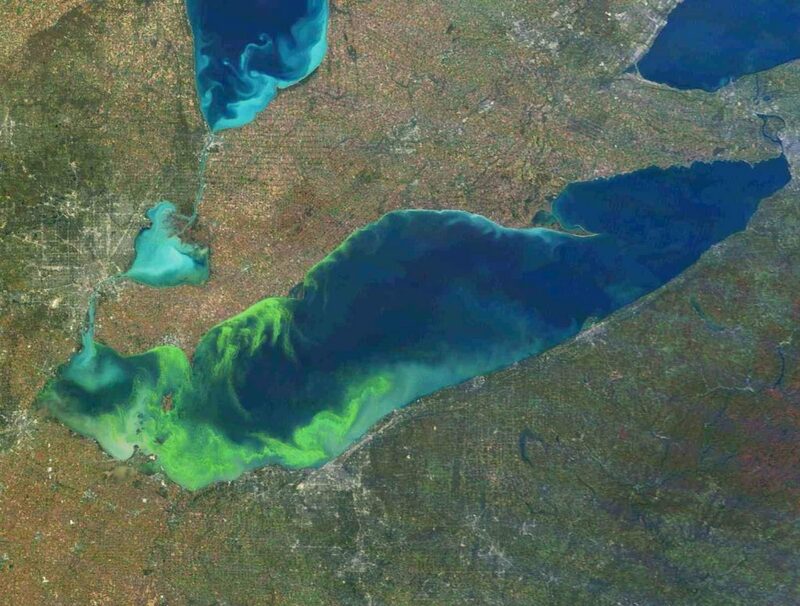 Satellite imagery of an algae bloom on Lake Erie highlights concerns over water quality in the region. While algae and phosphorus both occur naturally in freshwater, high amounts of phosphorus contribute to excess algal growth. Wetlands are a natural solution. Wetlands slow the flow of runoff, trapping phosphorus and other harmful nutrients and keeping it from lakes and streams. Science indicates that the Great Lakes, and particularly wetlands, are critical to the health of Ontario’s environment and economy. Yet, despite growing awareness of their value, wetlands continue to be lost. 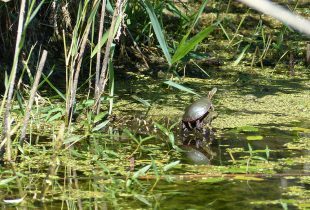 Research shows at least 72 per cent of southern Ontario’s large inland wetlands have been lost or converted to other land uses over the last 200 years, and this loss continues. In some municipalities, wetland loss exceeds 95 per cent of the historic wetland area. Extensive loss of wetland habitat throughout the Great Lakes, and particularly the Lake Erie basin, where wetland loss is highest on the Canadian/Ontario side, has contributed to declining water quality. 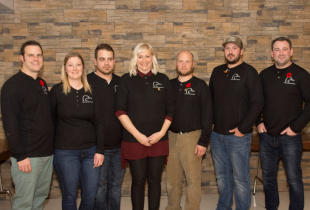 So, when the Government of Ontario passed the Great Lakes Protection Act in October 2015, conservation organizations like DUC and its partners welcomed the news. The Great Lakes Protection Act will not only strengthen the province’s ability to keep the Great Lakes and St. Lawrence River “drinkable, swimmable, and fishable,” it will protect and restore the waterways that flow into them. Passing the Act enables the province to address significant environmental challenges to the Great Lakes, including habitat loss, climate change, harmful pollutants and algal blooms. The announcement of the Act culminates a decade-long, collaborative effort between DUC and a number of environmental non-government organizations (ENGOs), including Environmental Defence, Canadian Environmental Law Association, and Ecojustice, who provided input to the process to help strengthen the Act. In the Chatham-Kent region, where Randall Van Wagner works, fertile soils along the Lower Thames River nourish fields of corn, beans and wheat. Randall says activities under the Act will complement the Thames River Conservation Authority’s ongoing initiatives to improve local habitat conditions that have positive benefits to Lake Erie’s water quality. Along with the provincial and federal governments, the conservation authority is targeting a 40 per cent reduction of phosphorus into the Thames River, which enters into Lake St. Clair. Unfortunately, Van Wagner notes, it can take threats to our precious resources to make people, and politicians, take notice. Eerie doesn’t begin to describe the toxic takeover happening in one North America’s Great Lakes. Fortunately, this iconic lake has hope for a cleaner, healthier future thanks to a new shared commitment between the Governments of Canada and the United States. 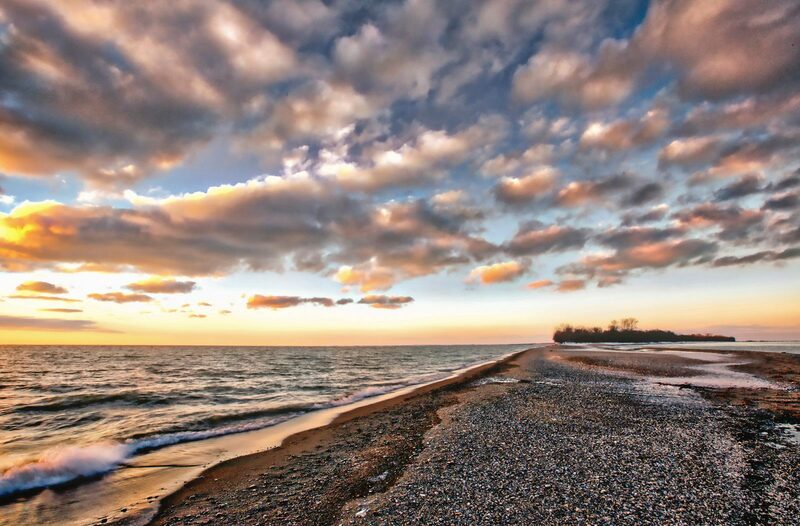 In February, Canada’s Environment and Climate Change Minister Catherine McKenna and United States Environmental Protection Agency Administrator Gina McCarthy announced the two countries have adopted targets to reduce phosphorus entering Lake Erie by 40 per cent. Ducks Unlimited Canada plays a significant role in protecting and restoring wetlands along the lower Great Lakes, but there is still much more to be done. These important natural resources are under threat. Help us continue to protect and restore wetlands by giving to support conservation.